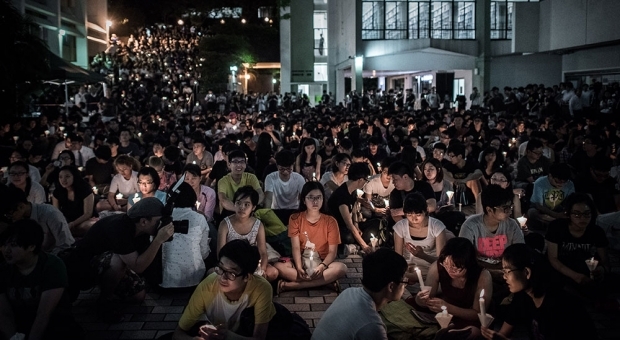 On June 4, 2015, Hong Kong University students sat in vigil to commemorate the crackdown on the mainland students who fought for academic freedom and democracy in Tiananmen Square in Beijing in May and June 1989. What is it that makes a place work? What is it that separates a world city from a second- or third-tier city? More specifically, what is it that has made Hong Kong (a major port city on China’s coast with a population of just over seven million) different from Dalian (a major port city on China’s coast with a population of just under seven million)? And what can continue to make it different and relevant and international? My belief is the answer isn’t a simple checklist, where having six or seven out of 10 items is a passing grade and good enough. Fundamental to a city being a world-class city is its belief in its own uniqueness and its pride in its institutions. The case of the University of Hong Kong and its council’s tortured, months-long consideration and ultimate rejection of distinguished legal scholar Johannes Chan as a university pro-vice-chancellor undermines that belief at its core and threatens what had been Hong Kong’s strength and uniqueness. It makes Hong Kong much more like Dalian than it was. Hong Kong’s uniqueness was encapsulated in the phrase “One country, two systems” that was supposed to define its post-colonial existence as a Special Administrative Region of China. The phrase represented the strong sense of independence in which Hong Kong’s institutions prided themselves, even though, to be fair, it was an ideal they weren’t always able to live up to fully in practice. An independent judiciary. An impartial civil service. A free press. An uncowed university system. A public atmosphere of free debate. As ideals these were all things that contributed to the atmosphere that made Hong Kong an international center, an incubator of talent, a locus of business and commerce. The strong smell of politics surrounding the Chan case was so overt and the circumstances—from email hacking to character assassination—have been so ham-fisted that it has eroded that very crucial aura of uniqueness. The question now is simply: is the experiment of a special, world-class Hong Kong over? If those behind the ultimately successful attacks on Chan are today simply reveling in their victory, they are making a mistake. For by winning this battle, they’ve made a huge step towards losing the war to keep Hong Kong prosperous and relevant. For if the universities are so subject to politics, how long before the courts are undermined? And if that happens, there is no reason to locate oneself or one’s business in Hong Kong as opposed to Shanghai, Chongqing, or, even, Dalian. If those people, however, come to realize the danger and now work very urgently and diligently to shore up the beleaguered institutions, from the press to the courts to the universities, then Hong Kong has continued hope. If Hong Kong’s sinking into the sleepy irrelevance of a second-tier city is actually what they want, then this was a great step forward on that sad journey. That Johannes Chan—Hong Kong University’s dean of the law school—was barred from being appointed a pro-vice-chancellor, has been called the end of academic freedom by lawmaker Ip Kin-yuen, and “a visible litmus test” by Jerome Cohen and Alvin Cheung in the pages of the South China Morning Post. I agree with Cohen and Cheung that this is indeed one of the most visible cases, one trumpeted in Hong Kong’s pro-Beijing media and a rallying point for HKU students and alumni. Precisely that it is so visible, however, should lead us to reflect on the ways in which academic freedom can be chipped away slowly and quietly, in quotidian and unseen ways. Unmentioned and unmentionable, these erosions are far more insidious. What does it mean that scholars are under surveillance? What are the implications of the stranger who appears in the audience of your lecture course, who appears again in the talk you’ve organized on China’s Cultural Revolution? How do you protect your undergraduates when these unfamiliar eyes and ears appear, unbidden? How do you speak to your own conscience when a visiting speaker or a lecture topic is deemed inappropriate? How do you shake off worries about your visa status, knowing only too well that your colleagues with less privileged passports may have it far worse? Asked to respond to the Chan case, I remembered a 2007 keynote address by political scientist and University of Wisconsin professor Edward Friedman, “Studying China is Dangerous.” In his speech Friedman traced a long genealogy of threats to those who had advocated clear and well-founded thinking on China, from John King Fairbank and Owen Lattimore in the 1940s and 1950s, to those of his generation who spoke up on American foreign policy in the context of the Vietnam War. Friedman himself spoke presciently on the possibility of “a discrediting of the Chinese forces of openness and reform and then their scapegoating and defeat by Chinese forces insisting on, at long last, standing up for China against those who supposedly threaten and contain China and keep it from its dignified and glorious destiny.” Friedman stressed that it would be our professional responsibility to defend speakers of truths, and I cite him here in the spirit of that integrity. To teach and to research on China is also to be an advocate, to support not only better understanding of China—of which Hong Kong is now part—but others who do so as well. Cohen and Cheung also called attention to Chan’s blackballing as an assault on the rule of law in Hong Kong. Here I think it is useful to consider what Nara Dillon calls “political vs. legalistic approaches to governance.” Writing about the role of “civil society” or China’s voluntary sector, Dillon suggests that we think of the state’s approach as binary. On the one hand, there are laws and regulations governing civil society, and having laws and regulations is important to the state’s legitimacy. But on the other hand, the ways such laws and regulations are implemented is actually via rectification reviews, a form of political campaign which owes its provenance to the legacies of the Mao period. If we may apply this description to Hong Kong, Beijing’s purported support for local rule of law in general and Hong Kong University’s institutions for leadership appointment in particular, exist as legalistic approaches to governance. But, as the case of Chan makes clear, laws and regulations may be trumped by a political campaign: Mao’s invisible hand in Hong Kong. The apparently politically motivated rejection of Johannes Chan’s appointment to a senior post in the University of Hong Kong makes many see the death of academic freedom in Hong Kong. The revelation by the University President, Peter Mathieson, that the rejection decision by the University’s governing council could be orchestrated by Beijing, and that some of his emails were hacked and published in pro-Beijing newspapers are disturbing but predictable. Ever since the sovereignty handover in 1997, there have been plentiful cases in which pro-Beijing newspapers launched Cultural Revolution-style critiques of outspoken scholars, calling for their dismissal from the universities. There was also an episode in 2000 when the Tung Chee Wah administration reportedly put pressure on the University of Hong Kong to shut down its opinion polls program that recurrently showed the unpopularity of the government. But these attempts were been futile so far, and constantly were rejected by scholars and university administrators. The rejection of Johannes Chan’s appointment is the first major victory of the authorities in reining the universities in. It sets a precedent that senior appointees of universities will need to pass the Beijing test. It is setting a new normal for Hong Kong academia. This episode will have wider political repercussions too. Incumbent Chief Executive C.Y. Leung is unpopular, even among the city’s elite. Some commentators predict Beijing will not support his reelection in the small circle election in 2017. But that’s wishful thinking. From Beijing’s perspective, C.Y. Leung is a good Chief Executive. His government ended the Occupy Movement last year without making any concessions or shedding blood. Now he scores again by finally breaching the defense of academic freedom. Beijing is likely to see him as an effective enforcer of its recent hardline policy of moving Hong Kong into the cage of one country, one system. There is a complication though. On the same day of the rejection of Johannes Chan’s appointment, Li Ka-shing, the most influential tycoon in Hong Kong, openly responded to Chinese official media’s recent harsh criticism of him over his withdrawal of investment from China. He said that these criticisms made him shiver and mentioned “Cultural Revolution-style thinking” in his statement. Back in 2012, he told the media that he had not voted for C.Y. Leung in the Chief Executive election. In the meantime, Jasper Tsang, a senior pro-Beijing politician and the current President of the Legislative Council, as well as the leaders of the Liberal Party, which represent business interests, have become ever more overtly against a C.Y. Leung’s second term. These people have been key allies in the Communist Party’s united front in Hong Kong, and they control a large number of votes in the elitist Election Committee that picks the Chief Executive. If Beijing eventually pushes for C.Y. Leung’s second term in 2017, they might be able to muster enough votes to support another candidate. Such a scenario would amount to a mutiny within the establishment. The rejection of Johannes Chan’s appointment is a victory of Beijing’s new hardline over Hong Kong, and it boosts C.Y. Leung’s chance for a second term. Such an elevated chance, ironically, inevitably will aggravate the internal rifts in the establishment. Hong Kong is heading toward more political turmoil. This time the turmoil is not likely to come from the streets, but from within the ruling elite circle of Hong Kong. The rejection of Professor Johannes Chan’s appointment is the latest sign of erosion in Hong Kong’s academic freedom. Although the final decision came as no surprise for many, it still generated widespread dismay and anger across the academic community and the public. The decision was somewhat expected following Chinese state media’s incessant attacks on Chan for his alleged role in orchestrating the Occupy Central movement, which morphed into the 79-day Umbrella Movement in late 2014. This sparked speculation that Beijing has identified him as a “black hand” behind the movement, hence the all-out effort to stop him from being appointed at all costs. The tendency to regard individuals or groups as culprits behind political activism has been a prevailing way of thinking in Chinese politics—note Beijing’s most-wanted list of pro-democracy activists long regarded as “black hands” behind the 1989 Tiananmen protests. Unfortunately, this logic seems to be seeping into Hong Kong: key supporters of the pro-democracy movement must be barred from senior positions in any important university, especially a post that manages academic staffing and resources. But the decision still left many dismayed, dashing any last vestige of hope that academic freedom could be defended in the liberal enclave. For it is rare for university councils to delay the appointment decision for this long, and equally so to ignore the recommendation of the search committee. Added to this was the reasoning of council members who spoke out against Chan's appointment before casting their final vote. According to council member and student union president Billy Fung, council members reportedly said Chan is unsuitable for the job because he does not have a doctoral degree (which is not unusual in law schools), because he was only searched for on Google Scholar four times in the past five years, and because he has too high a profile. These anti-intellectual reasons would have been hidden from the public by a confidentiality agreement, were it not for Fung’s heroic leak. The rejection of Chan’s appointment is also sending a mixed signal to the moderate democrats who maintained hopes of working with Beijing. After the 2017 Chief Executive electoral reform package was voted down by the pan-democrats in July, a new moderate faction has re-emerged and is seeking opportunities to engage with Beijing. There are also signs that Beijing is attempting to mend relations with the moderate democrats. A soft-spoken and moderate liberal, Chan is perhaps closest to the ideal type with whom Beijing wishes to cooperate in the broader pro-democracy camp. The decision to reject his appointment serves to contradict Beijing’s recent conciliatory gestures, conveying a message that there is not much room for engagement with the moderates. Ultimately, this leaves only one way out for Hong Kong’s pro-democracy movement: radicalization. The HKU Council's decision to veto the appointment of Johannes Chan—the only candidate recommended by an independent search committee—represents merely the latest round in Beijing's attacks on Hong Kong's fundamental institutions. Two particular phenomena stand out: the sordid tactics deployed against Chan, and the extent to which local governing institutions have been co-opted by Beijing. As Jerome Cohen and I pointed out in a recent column, two Party mouthpieces alone launched a fusillade of 350-odd articles vilifying Chan since November 2014—when it was first rumoured that Chan would be appointed pro-vice-chancellor. The debacle also became the subject of mobilization by pro-Beijing groups suspected of “astroturfing”. Similar Cultural Revolution-style tactics were deployed against the Occupy Central movement from its inception, and, as Ho-fung observed, have become a particularly ugly fixture of Hong Kong public life. Samson has recited the risible “grounds” given by Council members for rejecting Chan’s appointment, and I need not repeat them here. Suffice it to say that they—and the previous attacks on Chan’s qualifications and character by the pro-Beijing press—are entirely spurious. But they shed light on the extent to which Hong Kong institutions previously thought robust have been co-opted and subverted by Party interests. Of the 22 members of the HKU Council, six enjoy close political ties with Beijing. Only City University of Hong Kong and the Polytechnic University of Hong Kong ranked equal or higher in terms of percentage of council members with such ties. Others are members of Hong Kong’s business elite, who see little reason not to capitulate to Beijing. As with the HKU Council, so too with Hong Kong’s media. In its latest annual report, the Hong Kong Journalists Association cited external pressures from government and big business and internal pressure from self-censorship as the two biggest challenges facing the city’s journalists. Political pressure has also been brought to bear on publishers and bookstores; the Beijing government’s Hong Kong liaison office controls three major bookstore chains—which between them enjoy a market share of over 80 percent. Nor has Hong Kong’s much-vaunted legal profession been immune to such pressures. Former Law Society President Ambrose Lam was unseated after defending Beijing’s 2014 White Paper—which described judges as “administrators” of whom political loyalty was expected – and vocally defending the Communist Party, against the wishes of the Law Society Council. And current Secretary for Justice Rimsky Yuen courted controversy in 2008 when, while serving as the Bar Council’s Chairperson, he accepted an appointment as delegate to the Guangdong Chinese People’s Political Consultative Conference. Ultimately, the debacle surrounding the HKU Council’s veto highlights the fault lines inherent in Hong Kong’s system of governance. As with any system of devolved government, the region’s autonomy depends not only on restraint from the center, but on regional representatives able and willing to articulate and defend local interests. The tragedy that has befallen HKU—and Hong Kong at large—is that both of these elements are now in short supply. On 29 September, the Council of the University of Hong Kong, in a vote of 12-to-8, unprecedentedly rejected a search committee’s recommendation to appoint Johannes Chan as the university’s pro-vice chancellor. The vote marked a split between pro-Beijing elites—most of whom are proxies of business and professional interests—and representatives from students and teaching staff. In contrast, in a much wider suffrage of 7821-to-1371 concluded on September 1, the Convocation of the university urged the Council to accept the recommendation of the search committee. What has pushed the governing body of Hong Kong’s most prestigious university to act against precedent and the will of its graduates? Using confidentiality as a pretext, the Council refused to provide reasons to justify its decision. This response clearly falls short of the expectations of an open society and a world-class city, in which debate of this magnitude deserves thorough public scrutiny. Unfortunately, the official response brought us back to the “no comment” (wuke fenggao) era of the late colonial regime that was thought to be obsolete after the gradual democratization since the early 1980s. A few weeks ago, a Beijing official asserted that the lack of decolonization is the source of discontents in Hong Kong, but bridling public deliberation and academic freedom simply exhibits traces of “recolonization”. A more worrying trend is the submission of the local elites in face of an apparently politically motivated decision. Since 1997, the majority of the local elites have already pledged allegiance to the new and authoritarian sovereign in Beijing. For a long period of time, however, their subordination has also earned them a degree of autonomy and the luxury of professional ethics, which were conducive to balance Beijing’s agenda of political and economic integration and Hong Kong’s autonomy and freedoms. The case of Chan makes clear that absolute submission instead of adaptive subordination is now demanded. Chan’s case further reveals the change in the relative strength of the state and civil society after the Umbrella Movement. Periodic mobilization of Hong Kong citizens against encroachment of their existing lifestyle and liberties is an enduring feature of Hong Kong politics. This kind of street politics has empowered the pan-democrats despite that they are the institutionalized minority. The unelected government is then forced to carefully consider the backlash from civil society when making unpopular decisions. Informal checks and balances are installed in the absence of democratic institutions. Yet, the spectacle occupation has not only exposed the mobilization limit of Hong Kong’s civil society but also justified Beijing’s hardliner approach. A sequence of controversial polices adopted in recent months are the forerunners. While discontents surfaced through the mass and social media, they have not transformed into collective actions. Academic freedom is then the last-ditch where the specter of encroachment falls. When civil society can no longer defend the city’s autonomy and the elites pass it on, Hong Kong will soon diminish to become just another Chinese city. The contingency along this structural change is the evolving conflict between the new hardliners and the longstanding tycoons, as discussed by Hung above. The Council’s rejection of Johannes Chan’s nomination as pro-Vice Chancellor of the University of Hong Kong (where I teach as an adjunct professor) marks a decisive slide in the standards of academic freedom in Hong Kong. For all the reasons explained above, the decision by the council is unprecedented and unprofessional in the extreme: well-established procedures were bypassed—apparently on the most spurious of pretexts. LegCo president Jasper Tsang—always the most honest voice in the pro-establishment camp—says as much when he notes that Chan’s political stance would make it difficult for him to hold a management position: “Some staff [in the university] might question whether [Chan’s decisions] not to promote them are related to their patriotic stance,” Tsang said. “These excuses could easily be made and would make Chan’s job very difficult.” This candid pronouncement reflects a widespread conception in Hong Kong that academic promotions and tenure decisions are or should be made in a top-down manner by the senior management. It is particularly disconcerting to see an HKU dean speak out publicly to endorse a decision that has been essentially been made in a black box. The rejection of Chan’s nomination is seen by many as part of a settling of scores after last year’s Umbrella Movement. It was preceded by a classic smear campaign spearheaded by the two pro-Beijing newspapers in Hong Kong, the Wen Wei Po and the Ta Kung Pao. It is disappointing that HKU has not tried to defend its own reputation by considering bringing a libel case against these newspapers, which repeatedly leaked confidential information that can only have originated from within the Council (how ironic to see the council members now protesting that the student representative has leaked his minutes of the meeting!). Internal disciplinary measures or warnings have been announced by the University against three faculty members (Benny Tai, Daniel Chua, Robert Chung) on the basis of allegations about misuse of donations made in a report that—once again—the Council has refused to make public. Johannes Chan was handed a warning on the basis of the same unpublished report. It is probably no coincidence that his case involves donations: one goal of the current campaign seems to be to provide evidence that “foreign forces” were involved in supporting the Umbrella Movement. Finally, this case suggests that the institutional safeguards enshrined in the Basic Law and Hong Kong’s legal system are no longer sufficient to protect Hong Kong’s core values. The colonial laws governing universities leave room for considerable political interference. Many of the stakeholders in Hong Kong academia espouse the paternalistic reasoning that prizes law and order over transparency and due process. As shown by Brian Fong, Hong Kong institutions, boards, and media organs are stacked with business leaders who are members of the National People’s Congress or the Chinese People’s Political Consultative Conference. The colonial legislation used to constrain public demonstrations has resurfaced: after the Public Order Ordinance had been liberalized under Chris Patten in 1995, the non-elected provisional LegCo in 1997 reintroduced the obligation for demonstrators to obtain a “notice of non-objection” from the police for any public demonstration, and police were empowered to ban demonstrations on grounds of national security. These are the colonial laws that the SAR government, despite calls for “decolonization” from Beijing, has used to prosecute the Umbrella Movement protesters. A judicial review in the Johannes Chan case is probably the only way to shed light on the allegations of political interference, though it is unlikely to reverse the decision. But belief in the rule of law alone and the virtues of procedure no longer seems sufficient. As I argued in a recent piece, widespread voter disenfranchisement may well lead to ending the pro-democracy camp’s veto power in LegCo next year. Calls to reform the existing laws, including the Basic Law, by Joshua Wong and others, will no doubt increase, with little chance of success. The relentless push to roll back Hong Kong’s core values, conceived in Beijing, will continue to be carried out with vigor and enthusiasm by a large part of the Hong Kong establishment.